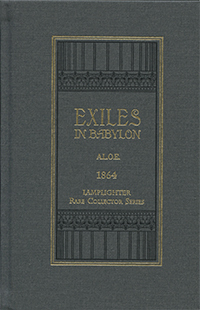 Exiles In Babylon, the second in the dramatic series Heroes of Faith by A.L.O.E. (A Lady of England), makes the Scriptures come alive! The pictures are so vivid, the characters so real, it is as though we are walking alongside Daniel and his faithful friends, experiencing the momentous challenges they are faced with. What courage! What great faith! Yet we are ever mindful that they were merely flesh and blood, no different than we are, and that our daily challenges can be met with the same fortitude and grit. From Mack Waller of Patterson, Missouri on 1/8/2019 . From Stephanie of Concord, North Carolina on 3/30/2017 . Exiles in Babylon is the second book in the "Heroes of Faith" series. It is a captivating tale that weaves together the ministry of Mr. Eardley with a series of lectures he gives to the main characters of the story. This second book of the series focuses on Daniel, Shadrach, Meshach and Abednego during Mr. Eardley's lectures. These lectures induce wonderful changes in his hearers. It also causes the reader to reflect on God's great faithfulness. Superb literature! From Anonymous of Roseburg, Oregon on 2/8/2017 . Each time I read one of the Lamplighter books, I marvel at the style, content and valuable teachings, page after page. This book, has become one of my favorites. I wished more of our modern day writers, could emulate this genre of writing. Very inspirational and potent lessons to everyday situations in an everyday life. Thank you Mark Hamby and Team. GOD BLESS YOU. From Lisa Rathert of Timonium, Maryland on 12/27/2014 .